What if you were bound for a new world, about to pledge your life to someone you'd been promised to since birth, and one unexpected violent attack made survival—not love—the issue? 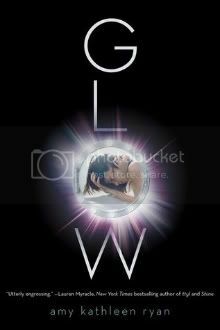 Glow was one of my top books for 2011 - it is captivating and the beginning of a series that is not to be missed. You can read my review here. I am very excited to have one copy the AUDIOBOOK of GLOW to give away! This contest is open to residents of the U.S. only. Must be 13 to enter. Please see my Contest Policy for more information. This contest will close on Thursday, January 19 at 12:00 AM CST. Thanks for the giveaway! I'd love to win this. I haven't tried audio books before. It would be awesome to hear a great story while got some work done!